This month's theme is Warrior Women – Wargaming with Female Fighters. 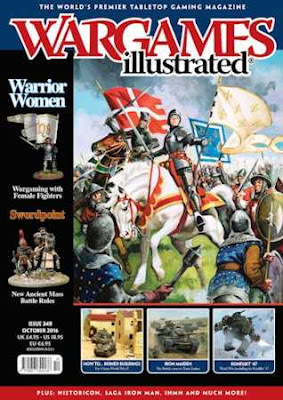 Probably the most famous female warrior in European history, Neil Smith looks at the wargaming opportunities for the campaigns of Joan of Arc. Inspired by last month’s theme Jim Graham provides us with an account and scenario for the 1918 Zeebrugge Raid. Olga of Kiev was not only a powerful leader in Medieval Ukraine but also went on to be granted Sainthood. The Gripping Beast team present a SAGA-based look at one of her most famous moments. The British are coming to Team Yankee! The Battlefront Studio team explain their role in the game and what models are going to be available. We talk to Annie Norman of Bad Squiddo Games about her ongoing quest to bring Believable Female Miniatures to the tabletop and life working in a male dominated hobby. Tired of skirmishing with tiny warbands? Ready to (re)enter the world of massed battles? Then these new rules from Gripping Beast are what you need! THEME: EN AVANT! MARIA THERESA VIVANT! Austrian queen Maria Theresa’s armies are explored, with added notes upon how they can be formed for battle upon the tabletop. Paul Davies brings us hints, tips and guidelines to help us to create simple buildings to populate our tabletop. Jim Graham shines the spotlight on the vital role played by female militia soldiers in the Spanish Civil War during 1936-37. A small taste of one of our recent WI events, based upon the thoughts of a number of the attendees. The story of the genesis of the game created by Loughton Strike Force for Salute 2016. Author Dan Mersey presents some thoughts, rules and army lists to take The Men Who Would Be Kings onto the plains of 19th Century America. Our annual round up of the largest wargames convention in the USA. Last month’s Battle of Adwa article featured photos of James Morris’s collection of Ethiopians and Italians. As befits an issue themed around blunders, we made errors in captioning. So, James very kindly agreed to discuss which figures he actually used for the campaign. David Wise presents a new setting for In Her Majesty’s Name, exploring a world of literature and cinema which is full of stalwart heroes and vile villains. A round up of what is available for the impatient gamer entering the alternate Weird War Two world of Konflikt ’47. Caesar's Gallic Wars Supplement ???? Halfway to our Goal to Save Trevilian Station! Help Save Antietam and the Maryland Campaign! Save Antietam and the Maryland Campaign!